A recent post by Dan Morris linking to an article on the Field and Stream Blog by Kirk Deeter caught my attention, it was about the ever increasing prevalence of “bobbers” on trout streams. He, like me, doesn’t think that it is quite the done thing and perhaps like much in life, whilst in moderation a level of errant behaviour can be given some leeway, an excess really is just that, excessive. I generally fish dry flies, and I am fortunate that my local trout will most of the time eat them if they are well presented. 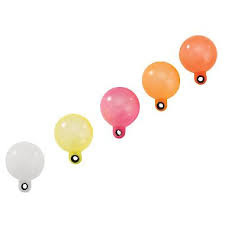 Even then I occasionally resort to “dry and dropper” methods, or in extremis: Euronymphing or fishing with coloured nylon built into the indicator. Dry Fly Fishing is my passion, it is intimate, delicate and visual and it really is the essence of our sport, at least for many. 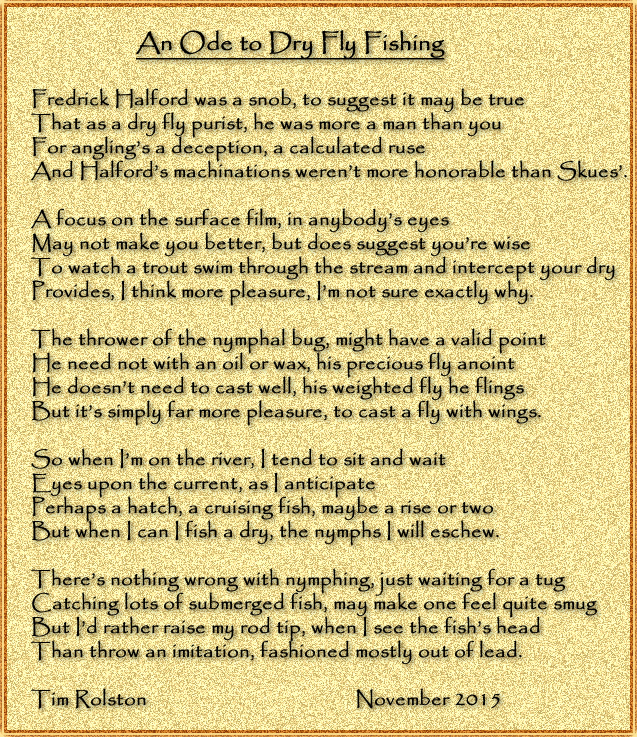 This “battle” between the surface and subsurface fly has lasted decades, Frederick Halford maintained that anything other than a high floating dry fly was sacrilege, whilst G.E.M Skues was villified for having the temerity to suggest subsurface patterns were perfectly acceptable in the eyes of man and God. All that back in the late 1800’s. I wish I had had a better maths teacher at school, it would have helped with my nymph fishing. A recent conversation with Ian Cox at the WTA trout festival got me to thinking more about something I have been considering in simple terms for some time. We were discussing weighting of flies and anyone who has read this blog or some of my other writings on matters piscatorial will know that I get rather disillusioned with discussions of “weight” of flies. When anglers are discussing weight of flies what they are trying to do is to get them to sink faster and stay near the bottom of the current, generally in fast water. It is just that weight isn’t the answer, in my opinion density is the answer. Reference on this blog Sink Rates, Brass, Tungsten and the Great Unknown. What I was pointing out over a beer or two was that to my mind the greatest problem for the nymph angler is the effect of the drag of the surface layers of current on the nylon and during a lengthy trip home it had my mind wandering to things mathematical. Having my mind wander towards calculus and such is a tremendously dangerous thing at the best of times. Of course there is plenty of subjective evidence which reinforces the idea that the thinner the tippet the better the flies will sink, we all know by now that if one uses pure mono when short line nymphing the flies sink and behave completely differently to when you have thick fly line in the water. But what actually is the relationship? To be honest I didn’t know, I wasn’t sure if the relationship between tippet diameter and drag was linear, exponential, logarithmic or what and I got this bee in my bonnet to try to find out. Here I step into the murky waters of my mathematical inadequacies so I am going to trust that I am getting things right at least mostly right. Frontal area of tippet in the water. What difference does it actually make to the amount of surface area dragging in the current if you change from 6X to 4X for example? Well that was fairly easy to fiddle with, admittedly tippet is round and not square but the general principle can be seen in the attached diagrams. Roughly speaking for each X factor you go thicker you gain some 25% to 30% of frontal area in the water. These figures were calculated for Stroft, one imagines in less scientific nylons the results may well be worse. That isn’t really very complicated but when you consider that fishing at a metre down (assuming that it is straight down, which of course it won’t be), jump from 4lb breaking strain Stroft to 6.6lb and the frontal area in the current increases by 600 square millimetres, which is a square approximately 2.4 cm on each side. To scale this is what the frontal areas of 1 metre of various tippet material looks like. 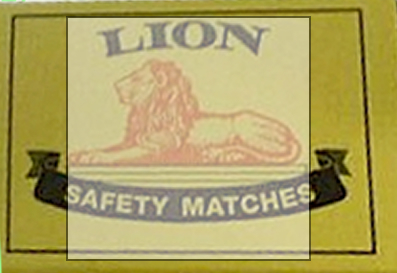 Graphically represented below, this is what 600 square mm looks like compared to a standard match box, The white area is 600 square mm, (the difference in frontal area between1 metre of the 4lb and 6.6lb nylon as set out above). Would you be happy tying half a match box to your leader and then trying to fish a nymph with it? Or more to the point, why bother with tying a slim Czech nymph if you are going to stick it on the end of a piece of nylon that far exceeds the size of the fly in terms of surface area in the water. Remember this is the difference between 4lb and 6.6 lb not the total area in the water, that is almost treble. Reducing the diameter of your tippet could do more to enhance the sink rate and control of your subsurface patterns than anything else. It is something of which I have been firmly convinced for some time. When anglers keep on about adding more and more 4mm tungsten beads to their flies I know that they would do a whole lot better to reduce the tippet diameter that they are using. It makes a far more significant difference but I have never previously seriously considered the maths. I could still be wrong, it seems a helluva lot of area to me and I have checked my figures over and over. If I have cocked it up, please let me know but I strongly suspect that this is the actual reality of fishing thicker nylon and when seen like this it is more than a little disconcerting. I do realise that there are a heap of factors beyond this, the current slows nearer to the bottom, the tippet it round and not square, the current varies and whilst sinking at least the tippet can go straight down. But then again once hanging in the current it is pretty much fully in the face of the effects of the moving water. With all those things taken into consideration I still think that it is a massive anomaly which most anglers don’t consider. They sit at home lashing lead and tungsten to their flies without so much as a thought for the tippet. Maybe it is time to change that. It should already be patently apparent that I am a very long way from a mathematician never mind an engineer. C is the Drag Coefficient of the object. And V is the velocity. Of course I am not particularly interested in the actual drag force, just the relationship between area, current speed and drag. 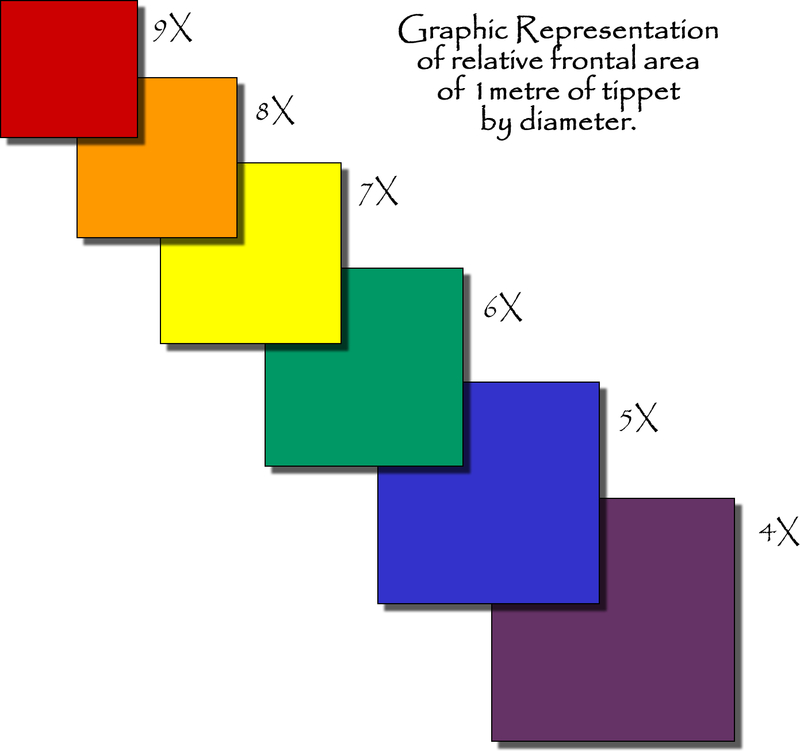 So with my limited mathematical capabilities it would appear that the relationship between drag and area is linear. The more area you have in the system the more drag you are going to get, increase the area by 30% (as in going up a tippet size) and you will increase the drag by an equivalent amount. (at least that is the way it looks to me). On the other hand if you increase the velocity of the current there is a square relationship, double the current speed and quadruple the drag. That is a whole different ball game. In pondering this little lot it strikes me in very simple terms that your tippet diameter when fishing sunken flies is a very very significant factor and not only that but as the current speed increases so it becomes even more significant in a squared mathematical relationship. Which probably explains why as current speed increases you quickly become unable to fish deep flies with an indicator and as it increases further you become unable to do so with a Czech nymph rig and finally you end up on pure mono or even braid in a desperate attempt to keep those carefully fashioned tungsten tidbits down there near the fish. It is indeed food for thought and no doubt some wag will be suggesting we take flow metres and micrometres with us on the stream. 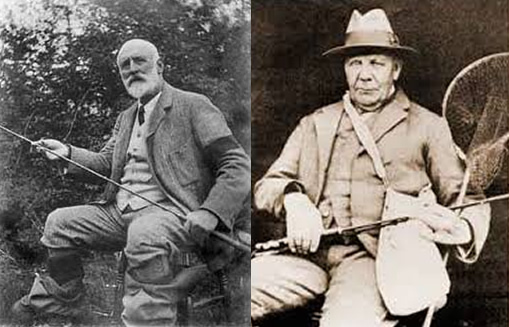 I am not suggesting that, what I am suggesting, and I would tentatively venture have proven, is that the diameter of your tippet has a massive effect on the way your flies fish and that the thinking angler should be more aware of that than I suspect most of us are. I have been fly fishing for a long time and contemplating all this to some degree or other for much of that and the graphic examples truly shocked me. Your thoughts are most welcome as indeed are your mathematical brains, if I am missing something please don’t be shy to share. I have been vilified before, it is a risk I take when combining limited maths skills, a passion for fishing and a drop of scotch.